Be sure to check out the brand new Maya Wrap website www.mayawrap.com (especially the 6th picture in the slide show on the front page). A while back I wrote an entry about our day at the photo shoot and here you will see Miss Grace in "action." There is another picture of her in the photo section with her "pretend mommy and brother." I should mention that Cheryl Muhr, NC photographer took the picture I'm attaching (though you can probably tell that from the copyright! :) and all of the photos on the website. As you'll see on the site, she does excellent work! 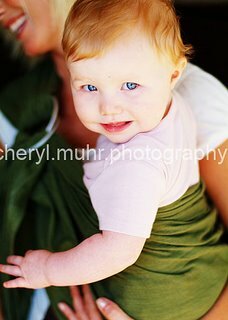 On the subject of maya wraps, while babywearing seems to be a hot new trend among celebrities and regular mommies alike, there really are some great benefits to both baby and mommy/daddy other than the "style factor." Babies who are carried cry less on average than those who are not, being carried creates the ideal environment for learning, emotional development and physical development. If you've carried a baby around with and without some type of carrier, you can vouch for the fact that a good carrier can really help ease the strain on your back! So, if you've got a baby or toddler, give babywearing a whirl! With the definition out of the way, I would like to take a minute to address the topic of what are appropriate proprieties of conduct when dealing with pregnant women. Just for background, I should first point out that pregnancy causes all kinds of hormonal changes in women, resulting in a gamut of emotions that cannot fully be understood by someone who hasn't experienced them. Pregnant women, in general, are extremely sensitive about their appearance. In addition to emotional changes, pregnancy brings with it skin conditions, unexplained aches and pains, and swollen extremities, not to mention the obvious changes to the belly region. During pregnancy, it seems that every day brings some kind of new "fashion challenge" as shirts are stretched to their capacity and pants either hit the underarms or continually slide down in true plumber fashion. Having said all of that, pregnant women are painfully aware of all of these issues. As tempting as it may seem to point them out to her, don't. It will only make things worse. The hormones will cause her to 1) be completely offended by your comments and 2) remember what you said and that you said it for time and all eternity. Now, just in case there are questions, let's go over a few of the most common (yet most unacceptable comments). 1) "You're huge!" - Easy rule of thumb here. If you wouldn't say it to a non-pregnant woman, most definitely DO NOT SAY IT TO A PREGNANT WOMAN. There is no possible way that this comment could ever be perceived by anyone other than a football player or a sumo wrestler to be a positive thing. Although it may be true, keep it to yourself. 2) "Are you sure you're not due earlier than that?" - Plain and simple, when you say that to a pregnant woman she hears "You're huge!" Refer to rule #1. 3) "Is the baby measuring large?" - Again, though the words are a little different, a pregnant woman hears...(you guessed it!) Back to rule #1. 4) "Are you sure you're not having twins?" - You probably already know what's coming. Just for informational purposes, most pregnant woman know whether or not they are having twins LONG before you can even tell they are pregnant. If they don't tell you they are having twins, don't ask. 5) "Wow, you look tired/miserable, etc!" - This is another one that may seem appropriate to say to a pregnant woman, but before saying it, think to yourself "would it give ME the warm fuzzies if someone said it to me?" If the answer is no, it's best left unsaid. I think this is a good time to point out, the very very most important rule of pregnancy etiquette that ever existed. Unless you have been specifically told that a woman is expecting a baby, never ever...I repeat...NEVER ask 1) if she is expecting a baby or 2) when she is due. This rule should appear in "How to Win Friends and Influence People" because I guarantee if you ask a non-pregnant woman this question you will do neither. Well--you may influence them, but definitely not in a positive way! Now that we've covered some of the taboo "conversation starters," let's talk about a few things that ARE appropiate to say to a pregnant woman. 1) "You are glowing!" - This is a great one because it makes a pregnant woman feel like the little life that is causing so many changes, is also making her beautiful! Important: do remember to use these exact words. While it may seem similar, "you look flushed" comes across in a totally different way. 2) "Wow, you look great!" - While you may be thinking to yourself "Wow, you look like a great whale," omitting 3 words from that thought before letting it escape your mouth will make all the difference to the pregnant woman! You WILL win friends with this comment, guaranteed! 3) "You are going to be a great mommy!" - This last is probably the most heartwarming and appropriate comment you can make to a pregnant woman. Trust me, whether it is her first pregnancy or she has 1 or more children already, she is questioning her ability to handle it and words of encouragement are always welcome.